This is another fantastic recipe that I have adapted from Pierre Herme’s Chocolate Desserts baking book. The Chocolate Crepes can be eaten as it is, but, I think they taste better with some simple filling such as the one I made for my kids here. I layered the crepes with chocolate and hazelnuts spread, sliced bananas, and topped-it off with some chocolate powder before serving. What do you think? Combine the flour and cocoa powder in a medium mixing bowl, then whisk in the sugar. In another bowl, whisk the eggs and milk together just to blend, then whisk in the beer and, finally, the melted butter. Pour the liquid ingredients into the bowl with the dry ingredients and whisk until well blended. Pour the batter into a pitcher or a container with a pouring spout, wrap with cling film (saran wrap) and refrigerate overnight. When ready to cook, whisk the batter gently just to blend the ingredients. If the batter is too thick (it should pour easily and have a consistency of heavy cream), add a little milk, a drop at a time. Rub a non stick pan (7 ½ inches) or crepe pan with a thin film of oil, then place the pan over medium-high heat. When the pan is hot, lift it from the heat, pour about 3 Tbsp of the batter, tilt the pan so that the batter swirls out and around to thinly cover the bottom. Cook until the underside is uniformly cooked, using a small spatula to lift up the edge to check. Loosen the side with the spatula and flip the pancake over. Cook until the new underside is lightly browned, then slide out of the pan onto a plate and keep warm while you cook the rest of the batter, oiling the pan when you need it. The first pancake is often not so great, but once you've got the hang of it and have got the pan temperature perfect, they'll work well. I think I need to be invited for breakfast :D This looks phenomenal. 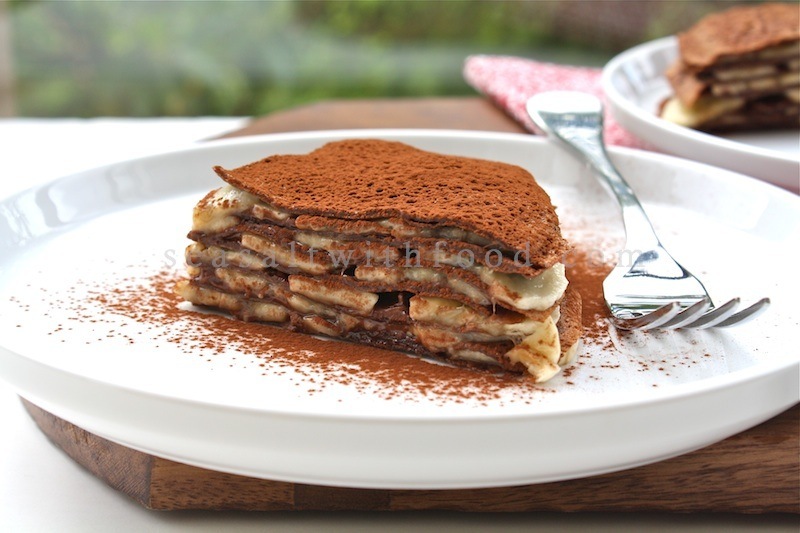 Nutella is probably my favorite thing ever and layered with crepes and bananas, yum! Your crepes look light as air! My family would love this. Thanks. 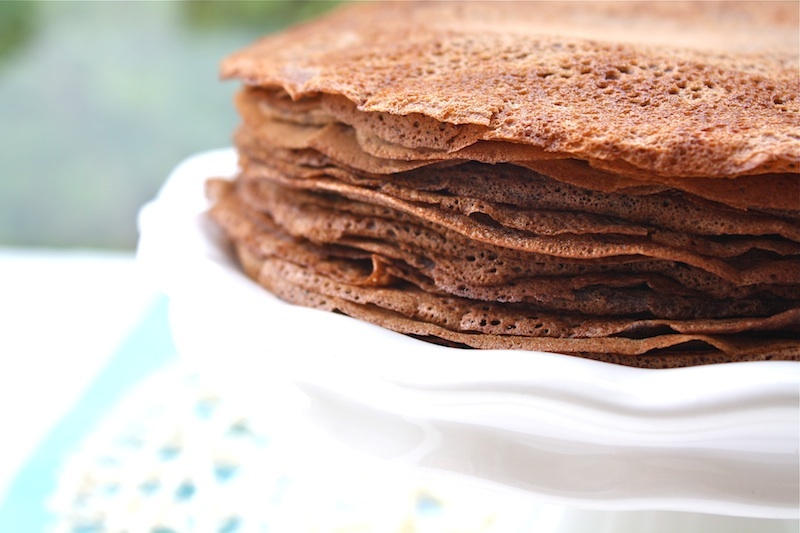 Love how you stacked the crepes on top of each other, making it look like a cake! Chocolate, hazelnut and bananas, can you go wrong? Thanks for this delightful post and photos! 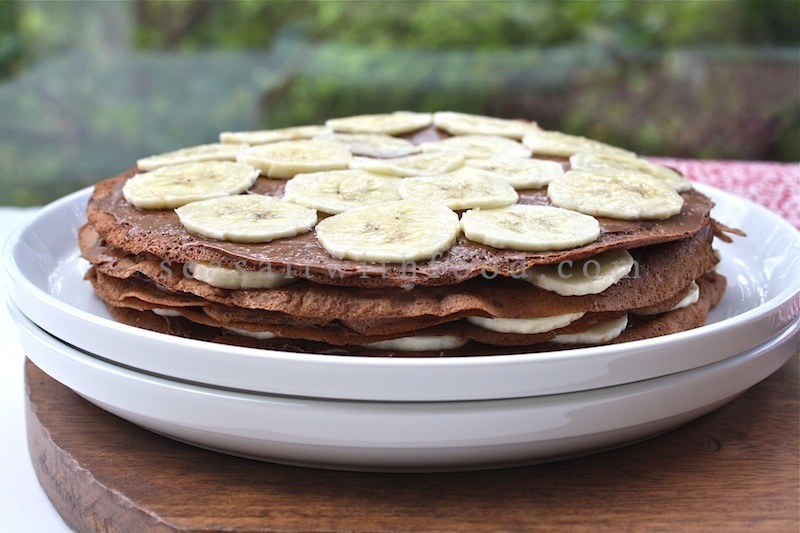 What beautiful chocolate crepes and I love the combo of Nutella and bananas! Your photos are fantastic! I have been waiting for you to post a pancake recipe so that I could link it to my blog at Pancake Zen. Thanks! I have that cookbook too! it' so inspirational! I have yet to make the crepes but yours look fantastic! way to go! Just look at all of those layers! The chocolate and banana flavours would be so good in this. These look SO good. I definitely think that these look amazing and good call on the nutella + bananas. I need this in my life today.